On the eve of New Year ’09 the Ultimate Windows Tweaker was featured as the Editor’s pick in the PC World January issue. Its great to hear again that the coming month issue of PC World has a new place for the this Ultimate tool “Ultimate Windows Tweaker” in the “TOOL OF THE MONTH”. 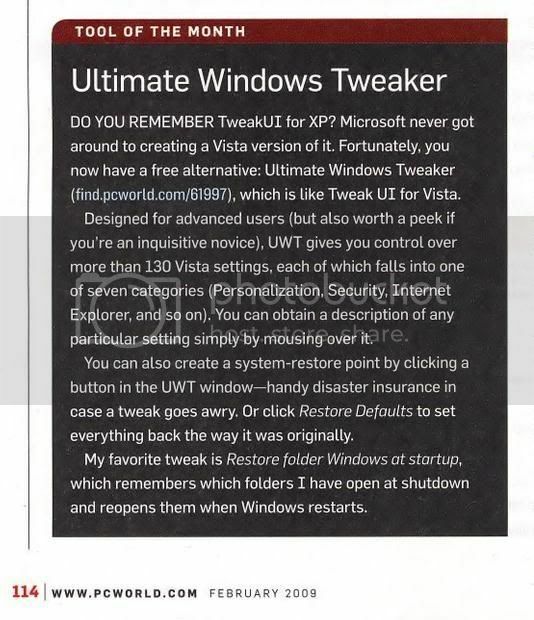 “ Ultimate Windows Tweaker is the TOOL OF THE MONTH of Feb’09 in PCWorld US edition.